I grew up camping in the woods of southern New Hampshire, yet somehow made it to the ripe old age of 34 before backpacking for the very first time. The kind of camping I had been exposed to prior to hiking to Havasupai had been limited to trips where a family could easily drive in with a car full of kids and equipment, and set up right next to where you parked without much effort. Ahhh, yes…. glorious car camping. Hiking Havasupai is a whole different beast. 1. Less is Best: Backpacking means carrying in all of your own food and gear for however many days you intend on staying in the wilderness, and for me that meant I absolutely needed to have those extra snacks, toiletries, that chair thing, and YES, both a tent and a hammock. Rookie mistake. When you’re getting ready to pack for your trip to Havasupai, really take a look at what can serve a double purpose, so you don’t have more than necessary in your pack. There are picnic tables at most campsites, and if you’re bringing a hammock, that could also double as your chair. A $2 foam sit pad probably would have sufficed to sit on in a pinch, and my back would have thanked me for leaving my 2 lb. chair at home. The first view of Havasu Falls as we entered camp. 2. Check Your Gear: If you’re planning to tent camp, check that you have your tent stakes, and a rain fly if you need one. You could leave that rain fly at home to save some weight, but remember that your camp neighbors may not be the most considerate with headlamps at night, and you may want some privacy for changing. Do a test tent set up in your living room if you need to get the hang of it. There is no shame in some living room tent game, and if you’re going to skip a tent altogether and only bring a hammock for sleeping, check that you have your hammock straps too. I almost made the mistake of leaving my tent behind, and would have learned the hard way at camp that my hammock straps didn’t make it into my pack. Don’t do what I did. Check your gear. View of the river from my tent. I loved falling asleep to the sound of the water. 3. Footcare and Footwear is Everything: Don’t go to Havasupai in shoes you haven’t broken in. Whether you prefer boots, trail runners or sandals, just remember that this hike is long and the sand is awful. Be as comfortable as you can. I happened to wear trail runners that had tiny “air vents” on the toes. I ended up having to stop a few times on the hike in to empty the sand from inside my shoes, and the bruises and blisters are still real several days later. Better to be over-prepared when it comes to footcare in my opinion. The trail through the canyon is long and sandy, but gorgeous! Just before the descent to Mooney Falls. 4. Hydrate, Hydrate, Hydrate: I can’t stress proper hydration and nutrition enough. Carb up the night before your ten mile hike in, and start hydrating three days ahead. Pack adequate snacks (my favorites ended up being macadamia nuts and nutty rice bites), but not so many that you want to chuck your pack over the nearest waterfall. Also remember that you’ll need some sort of rope or cord to hang your food bag to keep it safe from squirrels. You can purchase just about anything you’d need food-wise when you get into Supai village, two miles before camp. Ramen is life and electrolytes are your friend! Arrival in Supai Village. We were so thankful to see houses and horses! I bought a frozen gatorade when we reached town which ended up being a great purchase later in the evening, though it did add another 32 oz. to my pack for those last two miles into camp. I filled my 3L bladder with ice water the night before our hike in, and still had about a liter left when we got to camp that I was able to boil to use for lunch. There was also a fresh spring for refilling water bottles at camp, which we used for meals and to refill our bladders before the hike out on Day 3. I realized after hiking in that I wouldn’t need a full 3L bladder for the hike out, and was able to adjust accordingly. I ended up only taking about 2L for the return and then still emptied a good portion of what I had left for water before getting to the switchbacks… every ounce of weight dropped helps. Leaving town, two miles left to camp. 5. Leave No Trace: Did you pack too many snacks on your way in? Eat them, don’t feed the squirrels. And after you’ve eaten them, put your trash back in your pack and be prepared to hike out with it. Just like any other trail, it is incredibly important to pack out what you pack in, and leave no trace. I knew that people would attempt to skirt these principles here in Havasupai, but I honestly wasn’t expecting to see so many discarded floats, and trash ditched in the bathrooms. It is important to be as respectful of the land and the people who live here as you possibly can. 6. Tissue Packs Forever: While we’re talking bathrooms, make sure to pack in your own tissues or toilet paper. Nature WILL call on the trail, and it’s important to be prepared, but again if you’re needing to go and need toilet paper to do so, pack it out and don’t leave it behind in the canyon. A ziplock freezer bag covered in duct tape works great as a camouflage trash bag, while also minimizing any scents coming from your pack. When you arrive to camp there are several compost toilets, but they can (and did while we were there) run out of toilet paper, especially on busy weekends. It was extremely handy to have a tissue pack in my fanny pack at the ready for such an occasion. Excuse me, Pardon Me… Coming Through. 7. Trail Etiquette: Say hello to hikers as they pass. Remember that folks on their way out of the canyon have the right of way up trail. Always yield to horses and donkeys by stepping to the inside of the trail to give them clearance. And if you’re hiking out at night using headlamps, remember that you’re sharing camp with dozens of other people, so try to be courteous of your neighbors as you walk through their campsites with your lights on or music blaring. A little common courtesy goes a long way. One of the worst things we encountered on our trip was overzealous headlamp use from the campers across the river from us. I get that you want to stay up late to socialize, but the headlamp with four lights that looks like a monster truck coming at you may be overkill. Not a fun thing to have shining directly into your tent as you try to fall asleep. A simple one light headlamp will suffice here, and there are plenty of easy tricks out there for diffusing light for camp use. 8. Enjoy The Views: When you finally make it to camp, remember that you did this and take a few minutes to really let it all sink in. 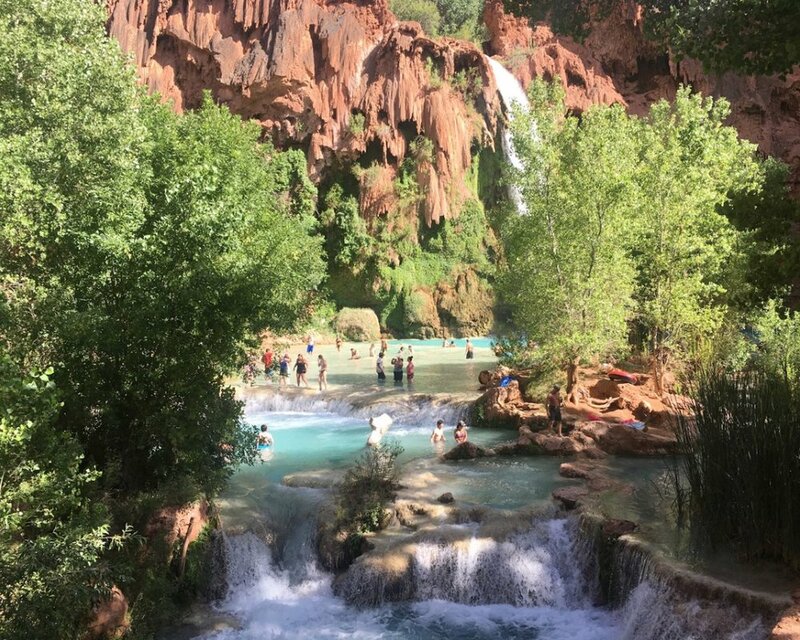 Go visit Havasu and Mooney Falls, hike to the Confluence if that’s your jam. Make the most of your time here and see all that you’ve been dreaming of. Photos will never do this place justice. There is just too much beauty to capture in a single photograph. So see it with your eyes and feel it with your skin, and let this place remind you that you’re alive. Havasu Falls From Another Angle. 9. Friends Make Everything Better: I still can’t believe how lucky enough we were, as a group of 13, to get permits to Havasupai for Memorial Day Weekend. We had some last minute changes to our plans when at first we thought our friend Kaitlyn wouldn’t be able to attend. But after a successful brain surgery and a stunning recovery, her doctor cleared her to make the trip. We decided then as a group that we would carry Kaitlyn’s things so that she would have less strain on her neck from a backpack. I am so proud of each of those ladies who were with us for stepping up for a friend in need. It wouldn’t have been the same trip without Kaitlyn there, and I’m so thankful that Girls Who Hike brought us all together just over a year ago. I learned so much about myself from these women on this trip, and I know now that this is just the beginning of my backpacking adventures! Erin is the Ambassador for the San Fernando Valley region of our Los Angeles, CA chapter. You can join her local meetups and discussions through the Los Angeles chapter by clicking here.